The GEMx Advisory Committee is a group of esteemed international educators and experts on global exchange that provides guidance on the development and sustainment of GEMx. Members of the committee work to ensure that GEMx serves the real-world needs of both Partner Institutions and students engaged in global exchange. Dr. Burdick is Associate Vice President for Education of the Foundation for Advancement of International Medical Education and Research (FAIMER), where he oversees the foundation’s efforts to create educational opportunities for international health professions educators. He has been a Co-Director of the FAIMER Institute since its inception in 2001. Dr. Burdick is Clinical Professor of Emergency Medicine at Drexel University College of Medicine and has been recognized for teaching excellence with the Lindback Award for Distinguished Teaching and the Trustees' Award for Teaching Excellence. A graduate of Oberlin College, the University of Pennsylvania Graduate School of Education, and Cornell University Weill School of Medicine, Dr. Burdick completed training in internal medicine at Boston City Hospital and is certified by the American Board of Internal Medicine (ABIM) and the American Board of Emergency Medicine (ABEM). Dr. Jorge Carvajal is an Associate Professor at the Facultad de Medicina de la Pontificia Universidad Católica de Chile (PUC), where he works as an attending physician, basic sciences principal investigator, undergraduate and postgraduate teacher, and currently is the Director of Extension and Continuing Education. After completing his medical studies, Dr. Carvajal went on to complete his residency in obstetrics and gynecology at PUC as well as a post-doctoral research fellowship in maternal fetal medicine at the University of Maryland School of Medicine in Baltimore in the United States. In 2000, Dr. Carvajal earned his PhD after successful completion of his doctoral thesis titled “Mechanisms underlying myometrial quiescence of pregnancy.” Since then he has developed a very productive line of investigation on the mechanisms of preterm labor and preterm birth that continues to today. In 2002, Dr. Carvajal earned a postdoctoral diploma in clinical education, including training in problem-based learning, from the University of New Mexico in the United States. His teaching work has led to his election by students as the best teacher of the fifth-year level in PUC’s seven-year medical education program every year since 2008. He also earned an Excellence in Teaching award from PUC in 2014. In mid-2014 Dr. Carvajal was appointed Director of Extension and Continuing Education at the Escuela de Medicina at PUC, where he has contributed to the development of nearly 100 programs of continuing medical education. Dr. Clarfield is the Sidonie Hecht Professor of Geriatrics and the Ben-Gurion University of the Negev (BGU) Director of the Medical School for International Health in Beer-sheva, Israel. Dr. Clarfield earned his medical degree from the University of Toronto in 1975. He has since specialized in family medicine, community medicine, and public health, and currently specializes in geriatrics. Dr. Clarfield was on the faculty of medicine at McGill University from 1978 to 1992. During that time, he was Chief of Geriatrics at Jewish General Hospital in Montreal and Head of the McGill University Division of Geriatric Medicine. He served as Assistant Dean of Students at McGill University from 1989 to 1992. In 1992, Dr. Clarfield moved to Israel. From 1994 to 2001, he was Head of the Geriatrics Division at the Ministry of Health in Jerusalem and was later appointed Head of Geriatrics at the Soroka Hospital. Dr. Clarfield’s research interests include Alzheimer’s disease and the related dementias, the organization of health care services, medical history, and ethics. He also publishes medical humor, book reviews, and miscellaneous pieces in various newspapers. Dr. Dukundane is currently a Senior Resident Physician in internal medicine at the University of Rwanda. Since early on in medical school he has been particularly interested in medical education and medical exchange. He was the National Exchange Officer for the Medical Student Association of Rwanda. He currently serves on the Board of the Physician’s Ultrasound in Rwanda Education (PURE) initiative as Logistics Advisor. Dr. Dukundane has been featured in the articles “In Desperately Poor Rwanda, Most Have Health Insurance” (New York Times, June 14, 2010) and “World Healer” (Western University of Health Sciences News, March 4, 2008). Dr. Dukundane has a particular interest in serving underprivileged people and has worked extensively with the Rwanda Village Concept Project and JeffHEALTH exchange, and with the International Federation of Medical Students’ Associations as a Local Exchange Officer for student elective exchanges. Recently he has been working on retention of doctors in rural Rwanda through capacity building of the Rwanda Medical Association. Dr. Dukundane is also a member of the World Medical Association Junior Doctors Network. Dr. Gandes currently serves as the Vice Dean for Academic and Student Affairs at Universitas Gadjah Mada (UGM) Faculty of Medicine in Indonesia. Before her appointment as Vice Dean, she was Head of the Department of Medical Education and Director of the Master Program in Medical Education. From 2010 until 2016, she was selected to serve as an executive committee member for the LINQED international educational network, based in Belgium. She is also ambassador for the Indonesian region for the Association of Medical Education in Europe (AMEE). After completing her Medical Doctor degree at UGM in 1997, Dr. Gandes earned her Master degree in 2001, graduating with distinction from the Centre for Medical Education, University of Dundee, Scotland, UK. She later earned her PhD in Medical Education from the same institution. Dr. Gandes began her career in Medical Education as a lecturer and went on to become the head of the Committee of Student Assessment at the UGM Faculty of Medicine. She also served as Chair in the division of Examination Development, National Committee of Competency Examination for Indonesian Medical Students. Dr. Gandes is a speaker at hundreds of national seminars, workshops, and conferences. In 2008, she was awarded an Endeavour Executive Fellowship from the Government of Australia. She is a 2013 Fellow of the FAIMER Institute and a member of the editorial board of the Indonesian Journal of Medical Education. She has supervised and served as examiner for numerous Master and PhD theses. Dr. Mamtani is a specialist in public health, occupational medicine, and integrative medicine. He is Professor of Healthcare Policy and Research, Senior Associate Dean for Population Health and Capacity Building, Professor of Integrative Medicine, and Public Health Clerkship Director at Weill Cornell Medicine-Qatar (WCM-Q). Prior to joining WCM-Q in 2007, Dr. Mamtani was a Professor of Clinical Community and Preventive Medicine and Associate Professor of Clinical Medicine at New York Medical College (NYMC), and a physician at Westchester Medical Center in Valhalla, New York. At NYMC, Dr. Mamtani developed and directed the Master of Public Health (MPH) in International Health and the Diploma in Tropical Medicine programs. As a principal investigator on a National Cancer Institute at the National Institutes of Health (NIH) grant from 1991 to 1995, he developed a new curriculum on nutrition and cancer for medical students at the college. Dr. Mamtani is a diplomate of the American Board of Preventive Medicine (ABPM) for general preventive medicine, public health, and occupational medicine. He is also board certified by the American Board of Integrative Medicine® (ABOIM®). He has written numerous articles on public health and preventive and integrative medicine, and has delivered lectures and seminars on various medical topics in the United States and abroad. As a monthly columnist for a local newspaper in New York from 2001 to 2007, he wrote on contemporary health issues, such as vegetarian diets, health care costs, lifestyle medicine, and mind/body medicine. Dr. Mamtani has served on government, hospital, medical school, and health care system sponsored committees in both the United States and the State of Qatar. He is an Honorary Consultant in Public Health in Qatar. As a consultant member of New York State Education Department site-visit teams, he contributed to the evaluation of international medical schools. He is a member of the New York State Board for Professional Medical Conduct. Dr. Mamtani’s interests include developing innovative medical and public health education programs, student wellness and career counseling, evidence-based approaches to patient care and chronic disease management, occupational medicine, global health, and emerging health care trends such as integrative medicine. Dr. O’Donovan is Senior Lecturer in Social & Preventive Medicine at NUI Galway and a regional Director of Public Health in the Irish health service. He coordinates the public health, health promotion, and global health content of the undergraduate medical curriculum. He qualified in medicine at NUI Galway and in public health at the London School of Hygiene & Tropical Medicine. He trained in general practice and public health in the United Kingdom. He has lived and worked in Africa and continues to be involved in research and education in several African countries. Research interests include health equity, reproductive and child health, communicable disease control, and sustainable development. Dr. Ellen Plumb is an Assistant Professor at Thomas Jefferson University (TJU) in Philadelphia, where she works as the Director of Special Programs for Sidney Kimmel Medical College. She also currently serves as the Family Medicine Clinical Clerkship Director and is on the Global Health Track faculty for Christiana Care Health System in Delaware. Dr. Plumb received her B.A. in Anthropology and Public Health from Boston University and completed her undergraduate thesis work with the Rakai Health Sciences Program in Rakai, Uganda. Before enrolling in medical school in 2005, she was a research associate in the Center for Mental Health Policy and Services Research at the University of Pennsylvania, where she conducted research around HIV and serious mental illness. As part of her medical training, Dr. Plumb completed a Doris Duke Clinical Research Fellowship at the Department of Population Health Science and Policy at Icahn School of Medicine at Mount Sinai, where she focused on community-based participatory research methods and diabetes prevention. After completing her medical studies, Dr. Plumb went on to complete residency and a Faculty Development Fellowship in Family and Community Medicine at TJU. During her residency and fellowship, Dr. Plumb directed a longitudinal community-engaged research study exploring determinants of mental health in refugee resettlement communities. In 2005, Dr. Plumb co-founded the Rwanda Health and Healing Project (RHHP) at TJU, a bi-directional medical education partnership between the TJU student organization, Jeff HEALTH, and the Rwanda Village Concept Project (RVCP). To date, the RVCP has helped to host more than 90 TJU health profession students focused on village-based health education programming, and TJU has hosted 30 Rwandan medical students for clinical rotations in family and community medicine, population health, and pediatrics. Since 2012, Dr. Plumb has served as the clinical program director of the RHHP. As part of her current work, Dr. Plumb also serves as the faculty advisor for TJU's Student Chapter of Physicians for Human Rights and is active as a volunteer clinician in the Penn Human Rights Clinic. Dr. Prabhu is a Professor of Medicine and Dean at Kasturba Medical College (KMC) at Manipal University in Mangalore, India. He is the first alumnus of KMC to be appointed Dean of the college. Dr. Prabhu joined the Department of Medicine at KMC in 1985 as a lecturer. In 1995, he became the Staff Advisor for the Students Representative Council. In 2001, he became a professor and Associate Dean. He is the recipient of a Good Teacher Award from Manipal University, and is a member of the Board of Management, the university’s highest decision-making body. Dr. Prabhu is a Rotary Foundation Scholar who visited Mexico in 1993 as a member of the Rotary Group Study Exchange Team. In 1993, he was a visiting faculty member at the Loma Linda University School of Medicine in California and a visiting professor at the Royal Brompton Hospital in London. 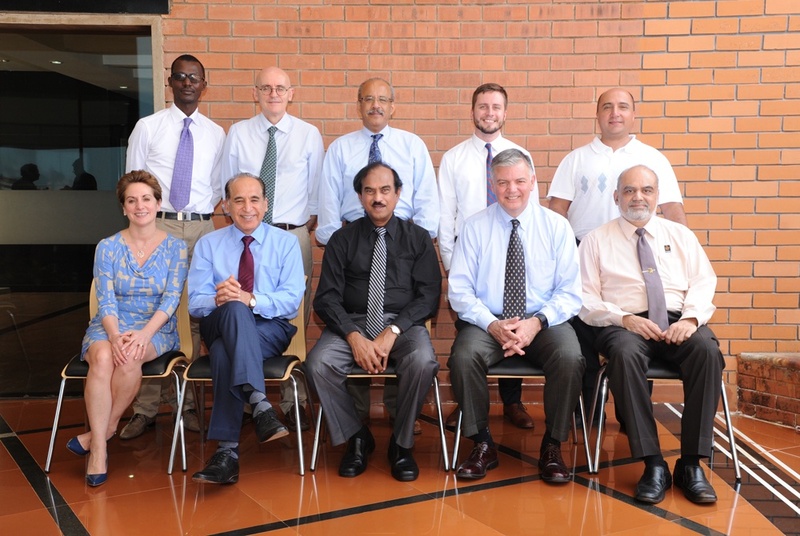 Dr. Prabhu has served as President of the Indian Medical Association (IMA) and the Association of Physicians of India. He is a long-time examiner for both undergraduate and postgraduate students taking final degree exams in universities across India. Dr. Prabhu has represented Manipal University at international conferences, including the 2010 International Association of Medical Regulatory Authorities (IAMRA) Conference in Philadelphia, the 2012 IAMRA Conference in Ottawa, the 2006 International Career Guidance Meeting in Mauritius, and the 2007 Manipal University International Alumni Meeting at Port Dickson in Malaysia. Last updated: February 5, 2018.